From 8 to 34 feet wide, with seven projection lengths from 4 feet 2 inches to 12 feet 6 inches. 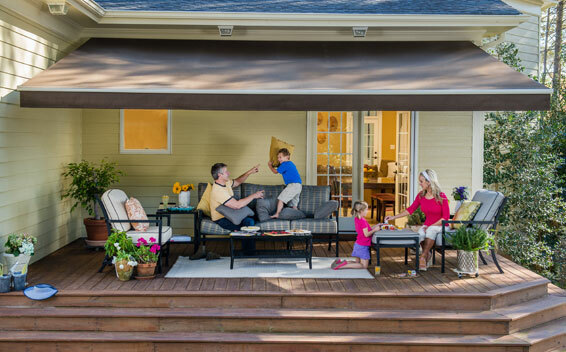 Adjustable locking awning pitch from 5° to 45° for maximum shade control. Awning Frames are available in standard colors of white, desert sand, mocha and brown. Warranty coverage includes: 10-year limited warranty on Solair® Pro framework. 10-year limited warranty on Sunbrella® fabrics. Five-year limited warranty on most standard fabrics. Five-year warranty on Somfy® motors. All warranties are good from the day of purchase. Powder coated, corrosion-resistant all aluminum awning frame components. Available in two standard frame colors: white and latte. Three awning widths: 11 feet 11 inches, 15 feet 8 inches and 19 feet 5 inches. Awning Projection is 10 feet 2 inches. Options include: Hood and end covers that protects the fabric, Solair® motor with progressive limit switch settings and more. Warranty coverage includes: 3-year limited warranty on Solair® Comfort framework. See complete warranty details for Coastal installations. 10-year limited warranty on Sunbrella®, Sunbrella® Mayfield Collection®, or Dickson® fabrics. 5-year warranty on Solair® motors. All warranties are good from the day of purchase.